← Rising and Setting Times of Stars. The usual practice for distinguishing the more conspicuous constellations is to establish reference lines in a known constellation and from these to memorize the directions in which other constellations lie on the celestial sphere. For example, one of the most well known constellations isUrsa Major which is otherwise known by various names such as the Great Bear, the Big Dipper or the Plough. 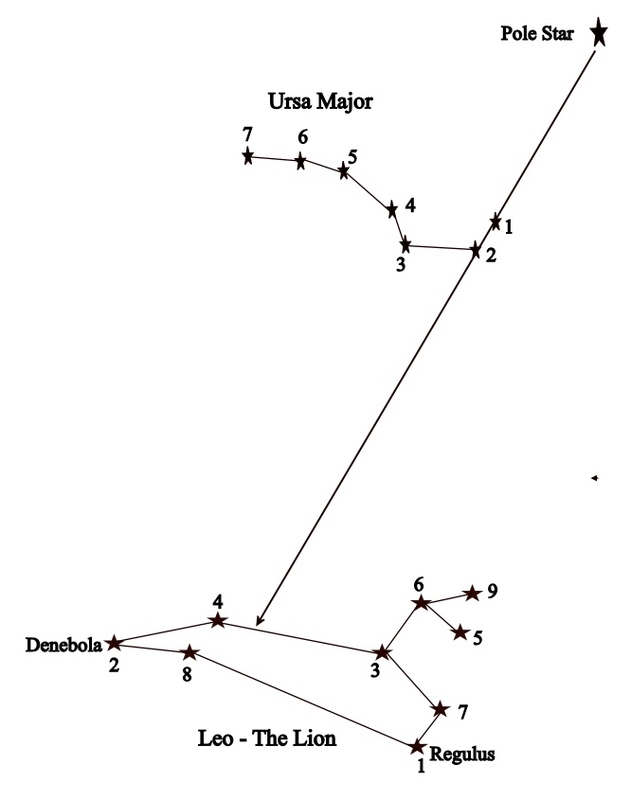 We know that Ursa Major contains a reference line known as the line of pointers. In the next diagram, you will see that the line joining star 2 to star 1 forms the line of pointers which points to the Pole Star, otherwise known as Polaris. Polaris is the brightest star in the constellation known as the Little Bear or Little Dipper. Of course, it is not sufficient to know only the direction in which a constellation lies with respect to another constellation; it is also necessary to know the distance. This presents us with a problem: whereas we measure distances on the surface of the Earth in miles or kilometres, in space these units of measurement have no significance. Instead, to measure distances between objects in space, we use degrees or angular distance as we say. The width of the first finger when held at arm’s length from the body subtends an angle of approximately 1 degree at the eye of the observer. The width of the tips of the first three fingers subtends an angle of roughly 5 degrees. The width of the palm of the hand will subtend an angle of approximately 10 degees. The span of the hand will subtend an angle of roughly 20 degrees. 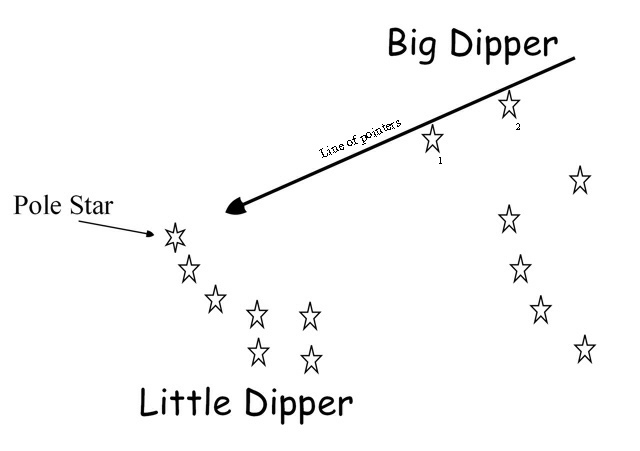 For example, the angular distance between Star 1 and Star 2 in Ursa Major is 6 degrees or roughly the width of three finger tips when held at arm’s length and the distance between Star 1 and the Pole Star is 28 degrees or roughly three palm widths at arms length. Regulus, star1 and Denebola, star 2, which are the brightest two stars in the constellation Leo are about 25 degrees apart which is roughly a hand span at arm’s length. 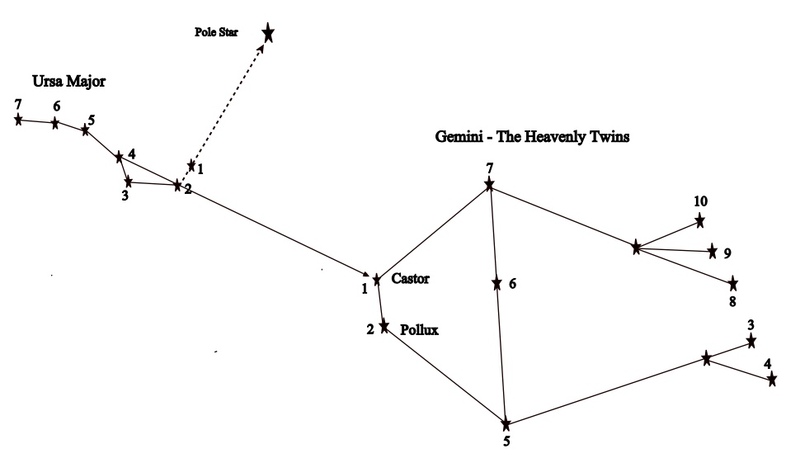 The line joining star 4 to star 2 of Ursa Major points to the stars Castor and Pollux which form the eyes of the Heavenly Twins, otherwise known as the constellation Gemini. Castor, star 1 of Gemini, can be found at 43 degrees (approximately 2 hand spans) from star 2 of Ursa Major. The Southern Cross, or Crux, is one of the best known constellations in the southern hemisphere, and is easily recognizable for the cross-shaped asterism formed by its four brightest stars. Crux (Latin for cross) is not visible north of +20° in the northern hemisphere but it is circumpolar south of 34° in the southern hemisphere which means that it never sets below the horizon there. The cross has four main stars marking the tips (alpha, beta, gamma and delta). Alpha Crucis is also known as Acrux (a contraction of ‘alpha’ and ‘Crux’). This is the brightest star in the constellation Crux. Beta Crucis, also known as Mimosa or Becrux is the second brightest star in the constellation. Gamma Crucis or Gacrux, is the third brightest star in Crux. 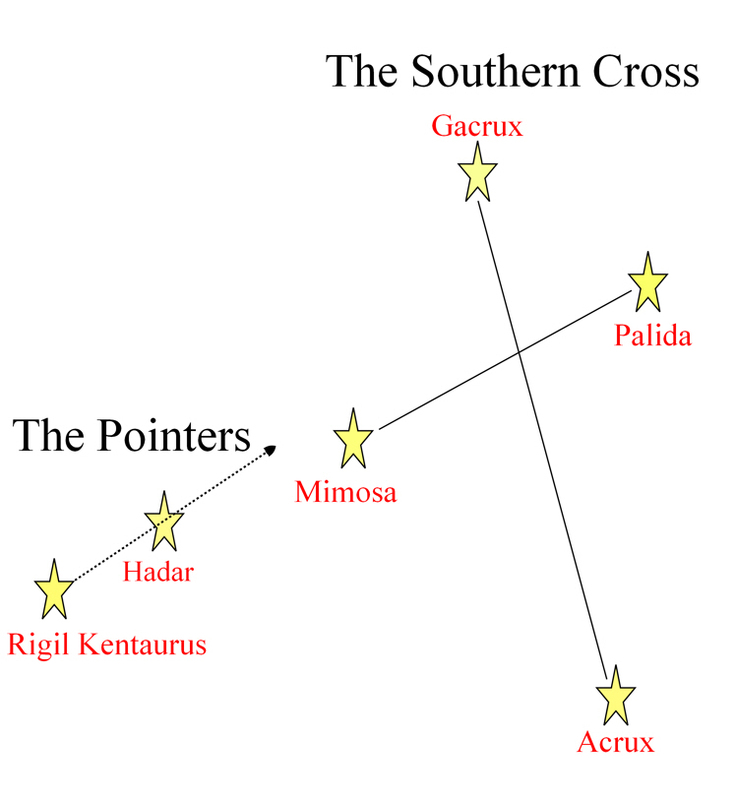 Delta Crucis or Palida is the fourth star and has variable levels of brightness . The Pointers. The constellation Centaurus contains two bright stars: alpha Centauri also known as Rigil Kentaurus and beta Centauri also known as Hadar, which we use as pointers to the Southern Cross. Make an imaginary line between Gacrux and Acrux. 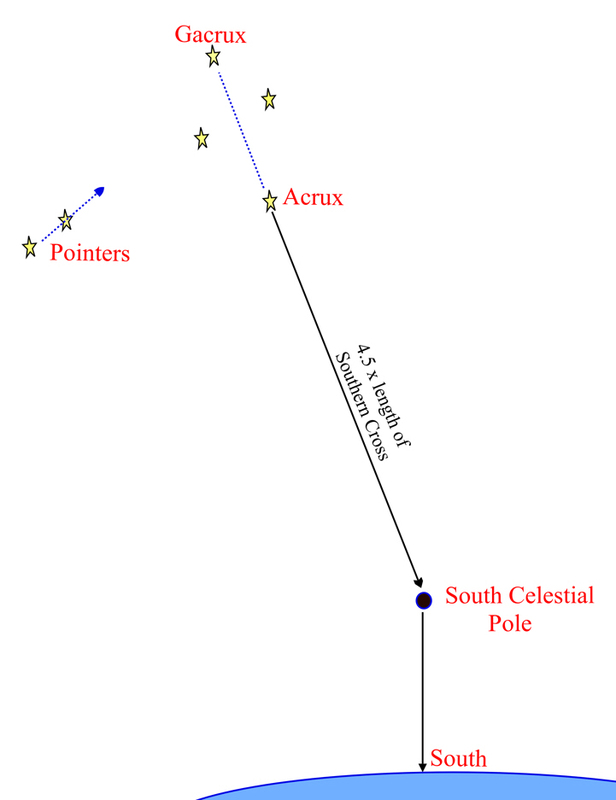 Extend this line from Acrux (the brightest star) for 4.5 times the length of the Southern Cross, as shown in the diagram. This will take you to the position of the South Celestial Pole in the sky. From the South Celestial Pole, drop a line down to the horizon. Where this line touches the horizon is the direction of south. Links: Rising and setting times of stars. Methods of distinguishing other constellations will be the subject of future posts. This entry was posted in astro navigation, astronomy, celestial navigation, navigation and tagged astro navigation, astronomy, celestial navigation, navigation, Planning star and planet observations. Bookmark the permalink.